New from HiFiMan! 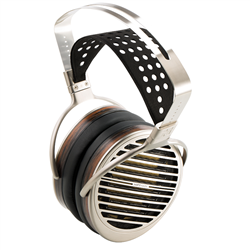 The Susvara is a planar magnetic headphone with an ultra thin diaphram - less than a millionth of a meter thin! The Susvara also utilizes "Stealth Magnet" technology. In Sanskrit, SUSVARA means all the world‘s harmonious and melodious sounds. As HiFiMan's finest planar phone, it was initially named named Edition 6 and received high praise at several prestigious audio events. In consideration of Edition 6’s acoustic performance that has surpassed any product in the HE or EDITION lines, it deserved a dedicated model name and that is: SUSVARA. It has achieved huge strides in terms of openness, transparency, and detail, so that it now sounds almost like a ‘junior’ version of the Shangri-La electrostatic. HIFIMAN SUSVARA is available now to order.